Offerings: AWS offers Xen-virtualized multitenant and single-tenant compute (Elastic Compute Cloud [EC2]), with multitenant storage, along with extensive additional IaaS and PaaS capabilities, including object storage with an integrated CDN (Amazon Simple Storage Service [S3] and CloudFront), a Docker container service (EC2 Container Service [ECS]), a batch computing service (AWS Batch), event-driven “serverless computing” (Lambda), and an aPaaS-like developer experience (Elastic Beanstalk). It is willing to negotiate large-scale single-tenant and on-premises deals (such as the U.S. intelligence community cloud deal). The AWS Marketplace has an extensive selection of third-party software and services. Enterprise-grade support is extra. It has a multi-fault-domain SLA. Colocation needs are met via partner exchanges (AWS Direct Connect). Locations: AWS groups its data centers into regions, each of which contains at least two availability zones (data centers). It has regions on the East and West Coasts of the U.S., and in Canada, Germany, Ireland, U.K., Australia, India, Japan, Singapore, South Korea and Brazil. It also has one region dedicated to the U.S. federal government. There is a China region operated by Sinnet, which requires a China-specific AWS account. It has a global sales presence. The portal and documentation are provided in English, Dutch, French, German, Italian, Japanese, Korean, Mandarin, Portuguese and Spanish. The primary languages for support are English, Japanese and Mandarin, but AWS will contractually commit to providing support in a large number of other languages. Provider maturity: Tier 1. AWS has been the market share leader in cloud IaaS for over 10 years. Recommended uses: All use cases that run well in a virtualized environment. Applications that are potentially challenging to virtualize or run in a multitenant environment — including highly secure applications, strictly compliant or complex enterprise applications (such as SAP business applications) — require special attention to architecture. 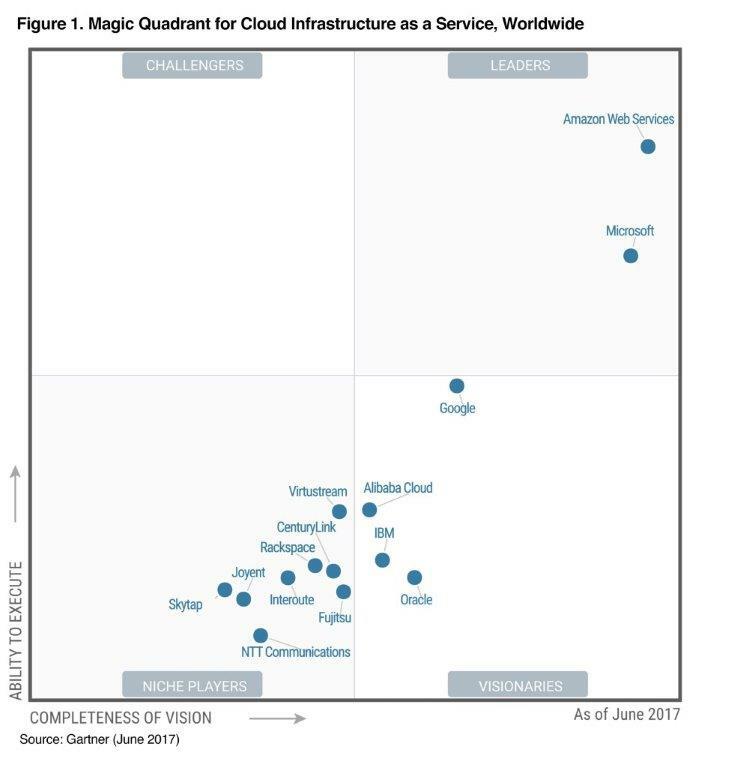 AWS remains the dominant market leader, not only in IaaS, but also in integrated IaaS+PaaS, with an end-of-2016 revenue run rate of more than $14 billion. It continues to be the thought leader and the reference point for all competitors, with an accelerating pace of innovation on top of an already rich portfolio of services, and an expanding impact across a range of IT markets. It is the provider most commonly chosen for strategic adoption; many enterprise customers now spend over $5 million annually, and a few spend over $100 million. While not the ideal fit for every need, it has become the “safe choice” in this market, appealing to customers that desire the broadest range of capabilities and long-term market leadership. AWS is the most mature, enterprise-ready provider, with the deepest capabilities for governing a large number of users and resources. Thus, it is the provider not only chosen by customers that value innovation and are implementing digital business projects, but also preferred by customers that are migrating traditional data centers to cloud IaaS. It can readily support mission-critical production applications, as well as the implementation of highly secure and compliant solutions. Implementation, migration and management are significantly eased by AWS’s ecosystem of more than 2,000 consulting partners that offer managed and professional services. AWS has the broadest cloud IaaS provider ecosystem of ISVs, which ensures that customers are able to obtain support and licenses for most commercial software, as well as obtain software and SaaS solutions that are preintegrated with AWS. AWS’s extensive portfolio of services requires expertise to implement. This is somewhat mitigated by AWS’s excellent business-class technical support, accurate documentation, extensive training and certification, and a partner badging system that includes an Audited MSP Partner designation that helps customers choose experienced and capable MSPs. However, customers should be aware that while it’s easy to get started, optimal use — especially keeping up with new service innovations and best practices, and managing costs — may challenge even highly agile, expert IT organizations, including AWS partners. AWS has just begun to adapt to the emergence of meaningful competitors. AWS is perceived as a cost leader, and is the key reference point for pricing in this market, but it is not eager to be the lowest-cost bidder in a competitive situation. Its granular pricing structure is complex; use of third-party cost management tools is highly recommended. Its disciplined approach to contract negotiation and discounts is based almost solely on customer spending and near-term revenue opportunity. Although its baseline enterprise agreement (EA) has recently improved and offers very competitive T&Cs even prior to negotiation, only a few of its services are covered by an SLA. To learn more, read the full report. It contains a lot of detail and is a great summary of the features and factors that our customers examine when choosing a cloud provider.